One of the simplest and delicious cakes out there and easily one of my favorites, too. I can’t believe that I have not posted it here yet, I thought I did. Anyhoo, like I said this is very easy and your home will smell unbelievably delicious when you make this-imagine warm lemon, vanilla and butter… Mmmmmm! I didn’t change a thing in the recipe except that I use a baking pan instead of cast iron skillet ’cause I don’t own one. I have tried replacing the sugar with muscovado at one time and it’s good too, you can try that if you don’t want to use refined sugar. The almonds of course can be substituted with any nuts that you like. mixing well after each addition.. This cake looks so simple but the taste..so delicious! Real asy and quick to make. Center a rack in the oven and preheat the oven to 350 degrees F. Butter a 9-inch cake pan. Pour the sugar into a medium bowl. Add the zest and blend the zest and sugar together with your fingertips until the sugar is moist and aromatic. Whisk in the eggs one at a time until well blended. Whisk in the salt and the extracts and stir in the flour. Finally, fold in the melted butter. Bake the cake for 25 to 30 minutes, or until it is golden and a little crisp on the outside; the inside will remain moist. Remove the pan from the oven and let the cake cool for 5 minutes, then run a thin knife around the sides and bottom of the cake to loosen it. You can serve the cake warm or cooled, directly from the skillet or turned out onto a serving plate. 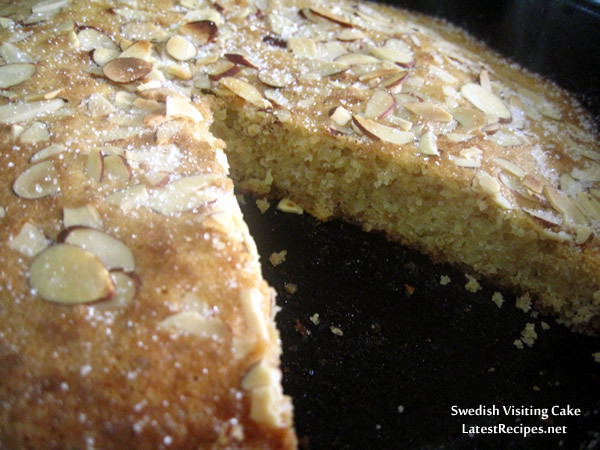 4 Responses to "Swedish Visiting Cake"
Tried this out. So easy to make and delicious! Looks beautiful! Would you be visiting with one anytime soon? I’ll have coffee ready. Mmm this looks delicious! No baking powder added and yet it looks so fluffy! I would love to try this too! That looks delicious. Love all the nuts sprinkled on top. I can imagine how good it is with a cup of coffee. Thanks very much for sharing.